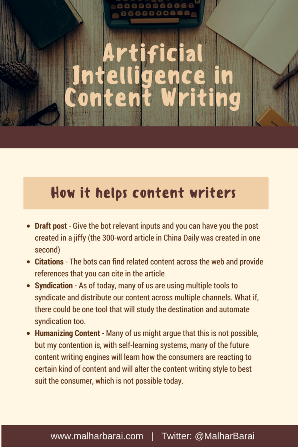 Recently I came across two websites ContentHop and WordAI promising to write and rewrite content using artificial intelligence. What piqued my interest was, there could already be some content that would have been written by these AI programs. Next came this news about a robot reporter in China which had written 300 words in one second! Boom! Are we entering the age of artificial intelligence and robots in the world of content writing. Now that is an important question? Will content marketing die or transform? A look at the content cited at the start of the article and you can hardly deduce that these have been written using bots. That means, as consumers, if the bot is doing a better job with writing content, handling the emotive aspects, thinking more closely as humans, we really do not bother. We are already seeing how the likes of Google, Facebook, etc are deploying self learning systems, which try to mimic the behaviour of consumers and show results, timelines that are more relevant to them. Extending the same concept to content writing, I would believe that systems are being developed that will keep learning what kind of content is resonating well with the consumers. This will improve the bot-driven content writing skills making it better for consumers. 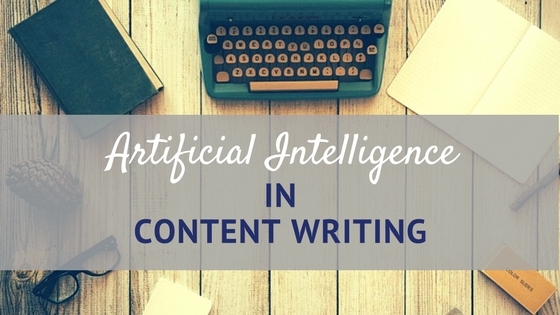 Will Artificial Intelligence Help Content Writers? Syndication – As of today, many of us are using multiple tools to syndicate and distribute our content across multiple channels. What if, there could be one tool that will study the destination and automate syndication too. Humanizing Content – Many of us might argue that this is not possible, but my contention is, with self-learning systems, many of the future content writing engines will learn how the consumers are reacting to certain kind of content. Hence the system will alter the content writing style to best suit the consumer’s reading preference. As of today, we still rely on CTRs and other means to know it. Will Artificial Intelligence in content writing kill the industry?